Pop Mama: Thanksgiving is next week? We have taught Cameron the baby sign for "thank-you" and he uses it, mostly with a gentle reminder, but sometimes he does it on his own. When he does it on his own, I swell with pride. As November ramps up and Thanksgiving is just next week, I have been thinking about the things / people / moments in my life that I am thankful for. 2. The baby who is squirming around inside me waiting to be born. Here I am at almost 37 weeks and although I am feeling pretty crappy, I am so thankful that this baby has a strong heartbeat and killer reflexes. I can't wait to meet the little guy! 3. My husband. The past few weekends have included a "Saturdaddy" break for me. Cameron and my husband have gone to Gymboree class, lunch and done errands just to give me some time to myself to rest. He also puts up with my whining, out of whack body temperature (he has a down comforter and I have a sheet) and general hormonal attitude. Thanks Babe! 4. Yoga pants. At this point even my maternity clothes are uncomfortable. 5. Cameron. I wouldn't want to leave out my sweet and sour toddler who makes me laugh everyday and after he hits me out of frustration, usually hugs me. I can't believe that he is going to be a big brother (and he has no idea that his world is about to be rocked). I never understood people talking about how they couldn't imagine loving a second child as much as their first -- UNTIL the second child arrived and their hearts swelled to new proportions. Now I understand. I don't have my second here yet, but I'm anticipating his arrival and looking at my first born son and wondering how I will ever find another face as precious as his. It will happen and I will be amazed at what the heart is capable of. I'm excited to find out. 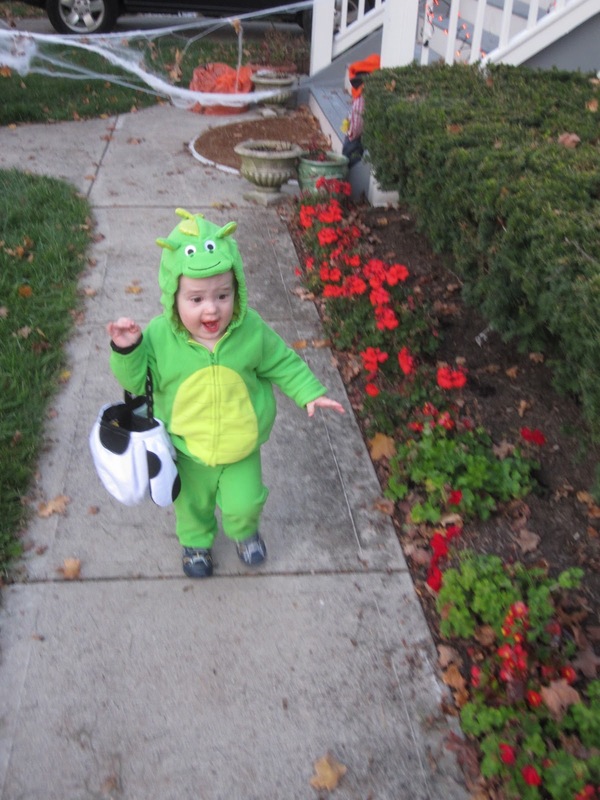 Here is the little monster on Halloween...he caught on to the free candy concept real quick. 6. The new Dunkin Donuts drive-thru on my way to work. Need I explain? There are so many other things / people / everyday miracles that I could add...I feel very blessed. Happy Thanksgiving to you all! I hope that this holiday week is a good one for everyone. Remember, don't fry a turkey inside the house.